Through the ICPD admissions process we identify candidates who are creative, broadminded and possess a genuine desire to learn and believe in hard work. To be eligible for the program, a student must either have a Bachelors degree or should have completed the third year of his/ her undergraduate degree. The ICPD Core Work Skills Program runs 3 iterations in a year. We have a rolling admissions policy which means you can apply at any time of the year and if you meet our admissions criteria, we will accommodate you in our next iteration. Since we have limited space, we advise you to start the admissions process at least one month before the start of the iteration you are interested in applying for. Keep visiting our website for important dates and deadlines. Our next iteration begins on 3rd March. 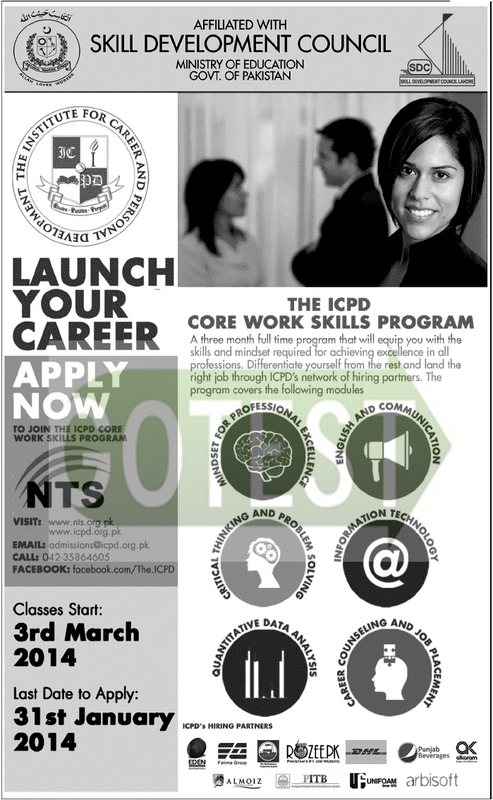 There are two ways to apply to the ICPD Core Work Skills Program. You can either apply through the National Testing Service (NTS) or apply directly to ICPD. Both processes are explained below. Sit for the test conducted by NTS on 9th February in either Lahore, Karachi, Islamabad, Multan, Faisalabad or Peshawar. The test will have five sections – Mathematics, English, Critical Thinking, IT and a Personal Essay. Testing logistics will be communicated to you after you register. Students interested in applying for financial aid should submit the ICPD Financial Need Assessment Form (download link) and all supporting financial aid documentation by 9th February to the ICPD Office of Admissions and Academics. If you clear the test you will be invited to ICPD for an interview. All academic supporting documentation including academic transcripts and copies of degrees. Additional documentation: Supporting documentation for work experiences and extra-curricular activities will be highly preferred. Submit the completed application form to the ICPD. The application is a Microsoft Word document that you can fill out directly on your computer using MS Word. Email the completed application form to [email protected] You are required to submit FORM I, FORM II and FORM III of the application. FORM V is optional. Shortlisted candidates will be invited to the ICPD campus to take our Admissions Test which will test their knowledge of Mathematics, English, Critical Thinking and IT. Applicants will also be required to write a Personal Essay. Students applying for financial aid must submit the ICPD Financial Need Assessment Form(download link) and all supporting financial aid documentation to the ICPD Office of Admissions and Academics. If a student does well on the application, test and essay, they will be invited to ICPD for an interview. The selected candidates from both processes will be notified after their interviews and mailed an admissions packet and financial aid decision. To apply for financial assitance, download the Financial Need Assessment Form from our website and submit it directly to us at [email protected] along with the required documentation.